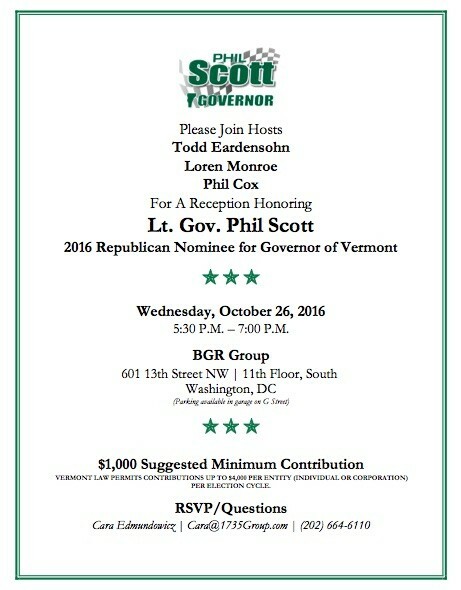 Less than two weeks before Vermont's gubernatorial election, Republican nominee Phil Scott traveled to Washington, D.C., for a fundraiser hosted by top corporate lobbyists. According to Scott spokesman Ethan Latour, the incumbent lieutenant governor raised $18,000 last Wednesday during his one-day trip to the nation's capital. While there, he was feted at an evening fundraiser at the headquarters of the BGR Group, a Republican-leaning lobbying firm. "He went because campaigns — particularly this one, with so much outside spending to compete with — cost a lot of money," Latour explained. According to an invitation Latour provided Seven Days, the event was hosted by BGR managing director and chief financial officer Todd Eardensohn, BGR lobbyist Loren Monroe and 50 State lobbyist Phil Cox. The invitation suggested a minimum contribution of $1,000 per attendee. BGR was founded in 1991 by Republican operatives Haley Barbour and Ed Rogers. Barbour later served as chairman of the Republican National Committee and then as governor of Mississippi. According to the Center for Responsive Politics, the firm's top clients currently include the American Health Care Association, Caesars Entertainment, Chevron, Samsung Group, the Pharmaceutical Research and Manufacturers of America and the republics of India and Bangladesh. Eardensohn, a Vermont native, manages the firm's political action committee. Monroe runs its state and local government affairs practice. He serves on the finance committee of the Republican Governors Association, which has spent millions of dollars on super PAC ads backing Scott's candidacy. Cox served as executive director of the RGA from 2011 to 2014 before cofounding 50 State with former Democratic Governors Association executive director Colm O'Comartun. The latter ran the DGA when Gov. Peter Shumlin served as its chair and has contributed $1,250 to the campaign of Scott's Democratic rival, Sue Minter. According to Latour, Scott has made only one other out-of-state fundraising trip since he won the August primary. On September 22, he traveled to Boston and back for an event hosted by Massachusetts Gov. Charlie Baker. Unlike the Scott campaign, Minter's staff has repeatedly refused to comment on her out-of-state travel, though it appears to be more frequent. As Seven Days reported in early October, the Democrat's fundraising records suggest that she made fundraising trips in late summer and early fall to Massachusetts, New York, D.C. and California. As of October 12, according to campaign finance disclosures, she had raised nearly $648,000 from out-of-state donors, while Scott had raised just $146,000 from those outside Vermont. Latour, the Scott spokesman, said his campaign was committed to revealing such information. 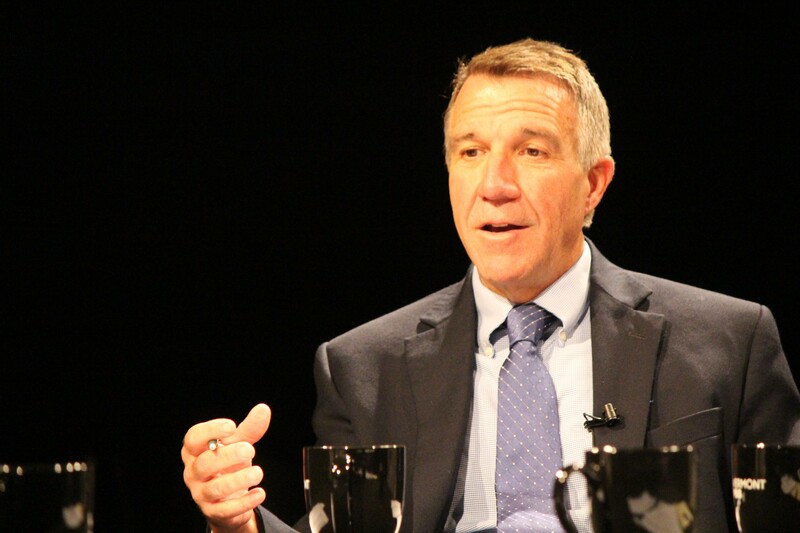 "Phil Scott's campaign is the only one in this race to provide this type of transparency," he said. "It reflects one of the many contrasts between the candidates and how important Phil feels transparency and accountability are to rebuilding faith and trust in state government."